Ed Sheeran performed the encore of his first night in Cardiff in a Wales shirt - with Gareth Bale's name on the back. 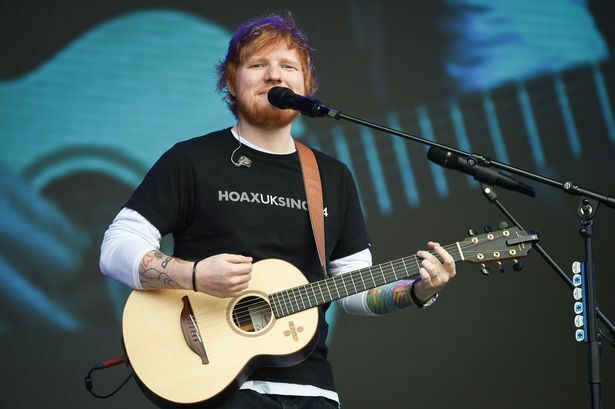 It topped off a spectacular night of the singer's first tour date in Cardiff where he gushed about Wales, its people, and the Principality Stadium. The megastar wore the Wales football shirt as he finished the night with Shape of You and You Need Me. And he told the crowd he has a "deep love" for Wales. He said: "I have a deep love for Wales. I've come here and played a lot of shows, written a lot of songs here and always have tremendous amounts of fun. "I had a gig at 18-years-old when I wasn't that popular and I do find it nuts that we're playing four nights at this stadium. I find it surreal. "This venue has been on my bucket list to play because when you come to play in Wales, you play the student union and the Motorpoint and there's a big gap after that. "It's taken four years to get here, but here I am. I am very chuffed. All the other places I've played have an open roof but this feels like an intimate gig because the roof is closed." Sheeran opened the set with crowd favourites Castle on the Hill and Eraser, he then took a moment to address the packed stadium. "I haven't packed a gig in Cardiff since 2014 and it was a lot smaller than this," he said. "I've just done a big UK and Ireland stadium tour and this is by far my favourite stadium I've played." He added: "I'm so excited because I know the Welsh are bloody nuts." It's the first night of a four-night run at the Principality Stadium.